MUNIRAH: You're sharing a meal, you get closer to the person, then slowly they open up, so you get to know each other. A mother, a grandmother and an active social worker and also co-founder of the Malaysian Genomics Resource Centre Berhad and Neuramatix group of companies. Datuk Munirah Abdul Hamid is actively involved in the cause she believes in. She regularly feeds the urban homeless in Kuala Lumpur through the PERTIWI soup kitchen and is the backbone of the organisation. "You're sharing a meal, you get closer to the person, then slowly they open up, so you get to know each other. "When you become closer, you know this is the problem, and you try and find a solution," she said. Datuk Munirah started the soup kitchen with her old friends from boarding school and successfully launched it on March 11, 2010. 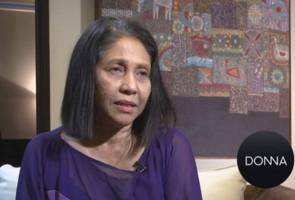 At one point, while talking to Astro AWANI, she recalled helping her mother when she was about five years old -- feeding the homeless back in Alor Setar, Kedah. She has since attributed her charity works to her mother.